In a town where exposure is everything, bite-size videos from Instagram and the even shorter Vine prove popular and even profitable. Enjoy whirlwind tours of Los Angeles neighborhoods, eavesdrop on celebrities, drive interest in your in-progress screenplay. Just when you thought this town's attention span couldn't get any shorter ? or its residents any more publicity-hungry ? along comes social video to prove that entertainment can be had in as little time as it takes to blurt out a one-liner. When photo-sharing site Instagram introduced its 15-second video feature last June, many predicted that it would spell the demise of the Twitter-owned 6.5-second video service, Vine, launched just six months earlier. After all, Facebook-owned Instagram offered a whole 8.5 extra seconds more Web time and a generally higher level of cinematography. But Vine, which just turned 1 year old, has continued to flourish alongside Instagram Video, in part because of the very different user bases each app serves. Industry town that it is, it's not surprising that L.A. has a disproportionate share of people who've latched onto the bite-size video format for fun and profit. And in a city where even 6.5 seconds of fame is an appealing prospect, videos quick enough to watch at a stop light are proving as popular as taco trucks ? but without the wait in line. Although Vine users most often record directly through their smartphones, and Instagram users often use more sophisticated recording equipment and then upload their videos to the site for sharing, both services are designed to work through simple-to-use, basically point-and-shoot mobile phone apps. But in a short time, each service has developed its own culture. "Instagram is all about being about a creative photographer and expressing yourself in that way," explains Karen North, director of USC's Annenberg Program on Online Communities. "On Twitter, people aren't going there to be creative as much, they're going there to express a quick thought." Instagram's and Vine's quickie videos, with their wide variations in quality, mirror the low art/high art tensions in the film and television industries, but it's too simplistic to assume that Instagram will always inhabit the high end and Vine the low. Instagram, which attracts more cinematographers than comedians, like a young starlet can sometimes fail to offer much beyond good looks. 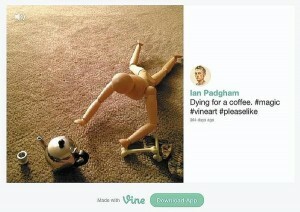 While Vine, which has a large share of quick-and-dirty wisecracks and sight gags, can often surprise with the amount of ingenuity users stuff into a tight package. L.A.-based filmmaker Ravi Vora, creator of a documentary about Instagram's ability to bring strangers together over a shared love of photography titled "An Instagram Generation," was thrilled when Instagram began planning to add video. Vora, who was invited to contribute footage for its launch, wasn't daunted by Instagram's time limit, likening it to the square format Instagram requires for photographs. "That is a definite box, but within that box, people have thrived and found new ways to showcase their work. And it's really hard to capture somebody's attention for that long on a medium where they're used to going through a hundred photos in that same amount of time." Vora is working on a series of Instagram clips shot in Yosemite and other locations he calls "visual poetry." "It's almost like a haiku. You write just a couple of sentences and deliver that mood." Vora has used and respects Vine but prefers Instagram for his own work. "For me it's definitely the choice for an artist who's looking to create a full visual feast." Vine's shorter format, Vora says, "really lends itself to comedy." "The three-act structure doesn't necessarily work, but there's a setup and a punch line." Vora mentions New York-based Vine star Jerome Jarre, whose comedy typically involves startling or surprising people and capturing their reactions, as an example. Vine has more than 40 million users, according to its website. Instagram does not share data or statistics around users. For Zach King, the primary advantage of Vine is the easy way that users can share content. One of L.A.'s top Vine stars, King, who is originally from Portland, Ore., but moved to Los Angeles to attend Biola University film school, started making videos while he was in the program. King gradually built his YouTube channel to a substantial following of 365,000 subscribers. On Vine he gained the same number of followers in a fraction of the time: just three months. King's videos also stand out because they're not just the one-liners and sight gags that proliferate on the service; instead he specializes in special effects and camera tricks. King, who graduated from film school a year ago and now makes YouTube videos and Vines as his full-time job, enjoys the "quickie" nature of Vine. "Vine was freeing. … It's kind of more rewarding to see a faster turnaround." Vine is less rewarding than YouTube in terms of income, but King has sponsorships on both services and is now making Vines for Nordstrom and Angry Birds ? a good business to be in as countless companies are hopping on the mini-video bandwagon for marketing purposes. King's long-term goal is to get into feature filmmaking but for the time being, he says, shorter formats are a place to hone his skills and build his brand. While there are a number other bite-size video options in the fray, such as YouTube's MixBit app, and the higher quality, even shorter FiveSecondFilms.com, for the moment, Instagram and Vine are leading the short-attention-span set.